The Edge lancero- Sports a cute pig-tail cap, this stick is medium brown and "paperbag" smooth with a slight lumpy feel and small veins throughout. The cigar tastes peppery off the bat, but immediately develops a nice creamy cafe au lait flavor with touches of cinnamon and nutmeg. Balanced and complex, it finishes nicely with notes of dried fruit, vanilla and caramel. Full bodied and delicious. Olde World Reserve lancero- This sharply box-pressed cigar is covered in a dark maduro wrapper that looks "ironed" smooth and feels firmly packed. Despite the tough draw on this complicated to make cigar, I really enjoyed the dark coffee flavor and caramel sweetness it imparts. "Earthy" is a good descriptor for this guy because I swear I could taste soil and coffee with each draw. There is some mild pepperiness in the background along with notes of leather. Overall, this cigar exudes elegance and sophistication due to it's well aged quality tobacco. Rocky Patel Decade lancero- This cigar is sharply box-pressed with minimal veins and nice smoothness. It drew well and tasted fabulous with rich mocha, tangy citrus, along with hints of spice and sweetness. You also get a nice nutty creaminess which adds great balance to the smoke. Medium to full bodied goodness. The Edge Maduro lancero- This cigar feels coarse to the touch due to it's toothiness. It's a well made dark maduro with a pig-tail cap. You get a nice dark roasted coffee taste with notes of chocolate on the finish. It's caramel sweet and nutty with a spice level that gradually increases as you smoke it. No problems with the draw on this baby. Rocky Patel Sun Grown lancero- This dark Colorado maduro cigar also has a cute pig-tail cap. This medium to full bodied cigar starts off mildly sweet and creamy, with notes of vanilla and black pepper. The earthy base flavor is surrounded by roasted nuts, raisins and spice. Lovely. The MSRP of this sampler is $70, but Silo Cigars has these limited supply boxes priced nicely at $59.50! (Who knows how many they have left?) If you are a fan of this vitola, this is a must buy to try before they are all gone. 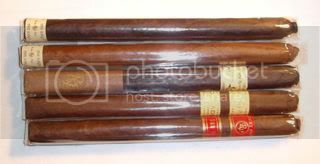 All the cigars are sized at an elegant 40 ring gauge by 7 inches long. Don't let the slim profile fool you, each one is full of flavor and should continue to age quite nicely.